Here’s an excellent 13-minute retrospective of Kilauea’s eruptions from the early 20th century right through June 25, 2018. It’s 11:30pm HST, and it looks like today’s “collapse explosion” is going to happen tomorrow. Are the explosion spacing themselves out more now? Too early to tell. There has been always some variation in their timing, despite the fact that it feels like we’re watching a magmatic equivalent of Old Faithful. Meanwhile, Fissure 8 continues exactly what it has for— what, a month now? 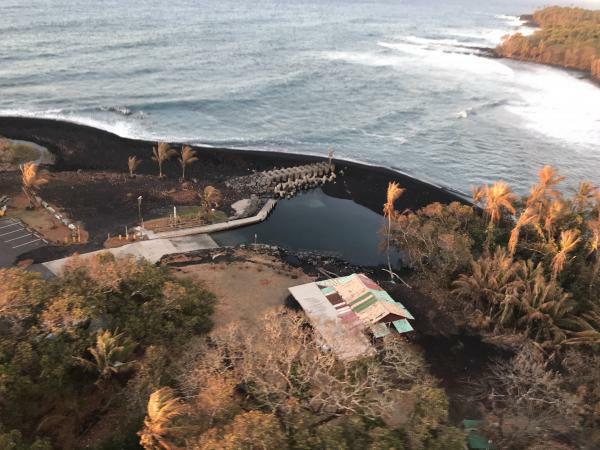 Fountains contained within its 180-foot spatter cone continue to pour out an 8-mile river of lava. Occasional spillovers near the head of the river usually don’t go past the margin of previous flows in this eruption. Fissure 22 is once again showing “incandescence” and pushing out small, short lava flows. 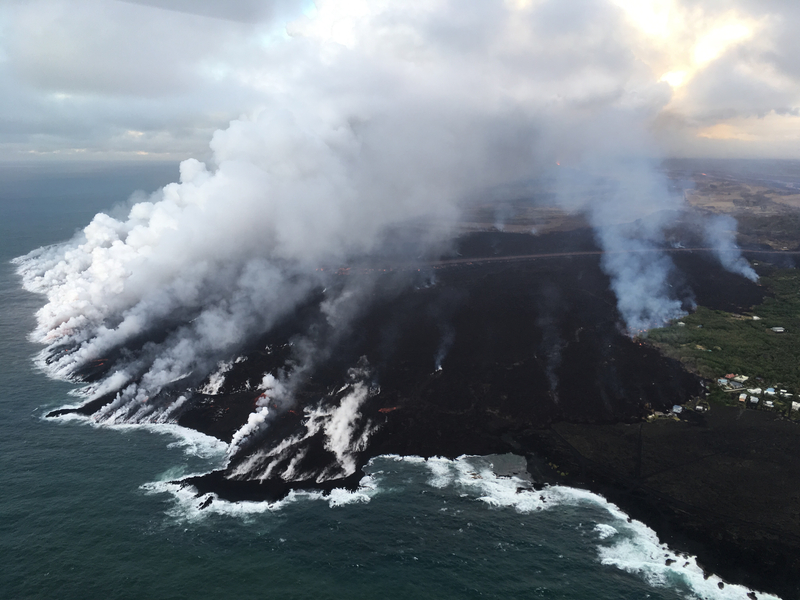 The ocean entry area fans out across a 1-km stretch of coast, but the bulk of the lava is dumping into the sea from Fissure 8’s main channel. Unfortunately, the northern margin of the lava flow has reactivated, too, pushing further into what’s left of Kapoho Beach Lots community. Eruption Update for June 27 at 4PM. 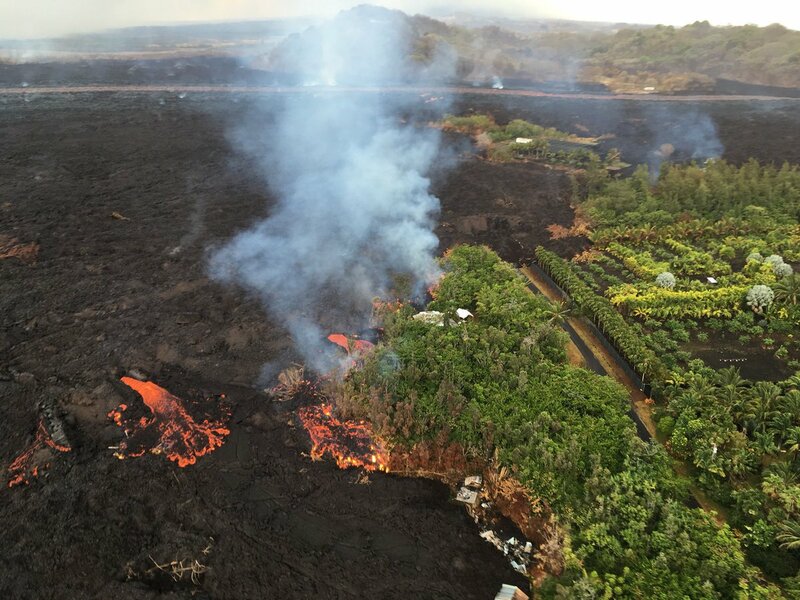 Due to active lava near houses in Kapoho, access by residents is not allowed. No additional houses have been destroyed at this time. On Tuesday, June 19, there was a Puna Community Meeting at Pahoa High School at 5pm. As usual, Steve Brantley of the Hawaiian Volcano Observatory/USGS gave an excellent slide presentation reviewing the current state of the Kilauea eruiption. He covered the “perched lava flow” in the Lower Rift Zone and the dramatic changes at the summit, placing each in context with previous similar events. (I didn’t realize there were records of many past Halema’uma’u collapses). Video of the entire meeting is posted here. The USGS talk starts at 42:40. I’ve transcribed it below, adding photos when I have something close (and restoring his graphs/diagrams which don’t come through very well on video recording). Friday was a busy day. 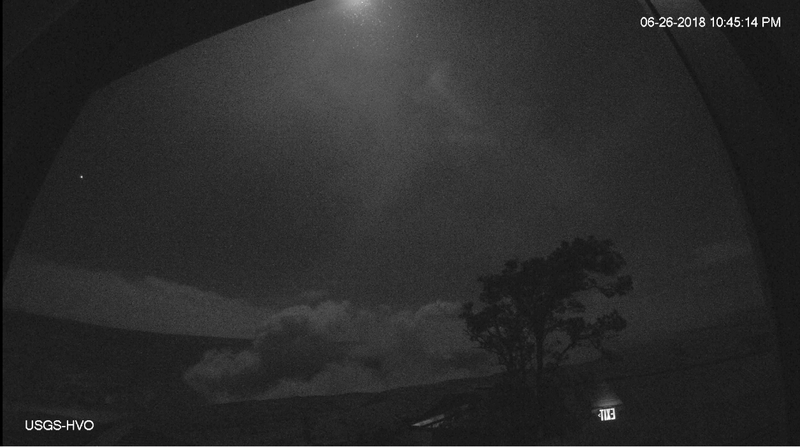 Starting before sunrise, more fissures erupted (USGS night video). 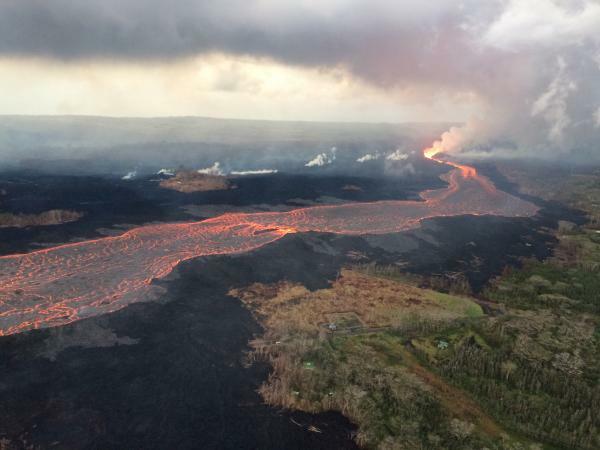 Here’s a USGS video of Fissure 3: first cracks, then steam, and eventually lava spatter. At 12:33PM. 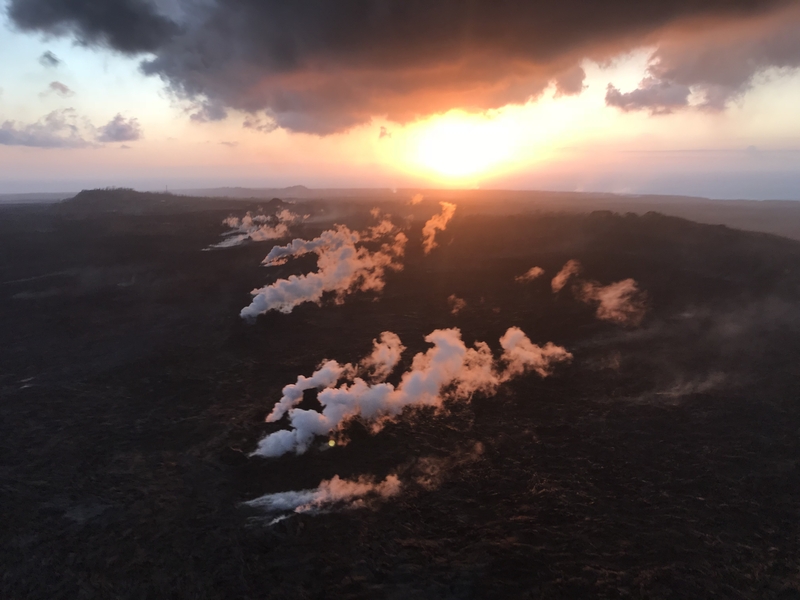 a magnitude 6.9 earthquake knocked out power to some customers, agitated the summit lava lake (video clip), sent up yet more ash from Pu’u O’o (video clip), and caused minor local sea level fluctuations (Good article: Honolulu Star-Advertiser). Also see informative HVO Volcano Watch photo essay. Below: Interview of HVO geologist Jim Kauahikaua, prior to 6.9 quake. Big Island Video News added lava footage from David Corrigan, Mick Kalber, Ikaika Marzo.